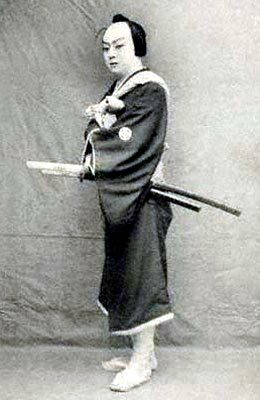 Son of Arashi Kichisaburô II, he was too frail to become a Kabuki actor and gave up acting at an early age to work in a cosmetics shop. He most likely died in 1865. 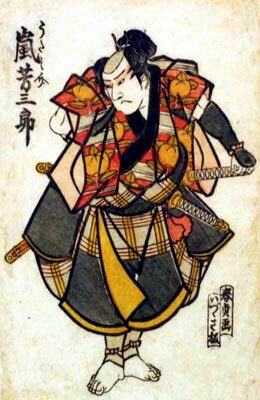 The actor Arashi Rikaku II held the name of Arashi Yoshisaburô II from an unknown date to the 10th lunar month of 1831. The actor Ichikawa Gonjûrô held the name of Arashi Yoshisaburô from 1864 to 1865. Adopted son of Arashi Rikaku II, he received the names of Arashi Yoshisaburô III and Arashi Keishi at unknown times. He quarreled with his father and broke off, taking afterwards the name of Sumida Chôzaburô. He disappeared completely without leaving a mark in Kabuki history. The actor Arashi Yoshisaburô IV held this name from January 1893 to October 1912. Arashi Yoshisaburô IV playing the role of Hayano Kanpei in the drama "Kanadehon Chûshingura"
The actor Arashi Yoshisaburô V held this name from June 1927 to November 1977. The actor Arashi Yoshisaburô VI held this name from December 1978 to August 1996. The actor Arashi Yoshisaburô VII is the current holder of the name since May 2010.